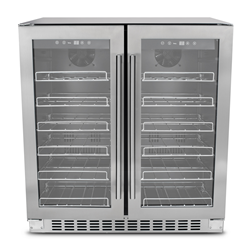 All three Dual Zone Wine Cooler models from THOR feature no-frost circulating systems and dual cooling zones for optimal storage of white and red wines. Shown: Dual Zone 36-Bottle Wine Cooler. Wine coolers are a must-have accessory for wine connoisseurs, and now with our affordable new Dual Zone Wine Coolers, consumers no longer need to justify a premium price to own a piece of luxury. THOR Kitchen, manufacturer of pro-style kitchen appliances, debuts three different models of pro-style Dual Zone Wine Coolers with affordable pricing from $849 to $1,599. These stainless steel wine coolers include both under counter and column options that range in storage capacity from 36 to 156 bottles. One zone ranges between 41 and 54 degrees for white wines, while the second zone is optimal for reds and stores bottles between 54 and 65 degrees. The under counter Dual Zone 36-Bottle Wine Cooler retails for $849 and features chrome pull-out metal shelves, double doors and can be either built-in or free-standing. At 23.5 inches wide, 22.5 inches deep and 32 inches high, this unit is ideal for smaller spaces. The 133-bottle model features 13 wooden shelves, tempered double pane reversible glass doors, and is Electrical Testing Laboratories (ETL) certified with a list price of $1,149. The 156-bottle model is also available as built-in or free-standing at $1,599 and includes wooden pull-out shelves, a reversible door and measures 23.5 inches wide by 26.5 inches deep by 71 inches tall. All three models feature no-frost circulating systems and dual cooling zones for optimal storage of white and red wines. They come equipped with a digital touch-pad control system with easy-to-read, adjustable blue LED readouts, as well as LED interior lighting with double-pane tempered glass doors to provide both aesthetic appeal and functionality that elevate any home or entertainment space. For more information about THOR Kitchen products, visit http://thorkitchen.com.